In the States, if a shot is being poured, it’s usually downed in one fast, hard gulp and while there’s definitely a time and place for that, I’ve realized I really enjoy the European culture of sipping shots, usually a post-meal liqueur or digestif. 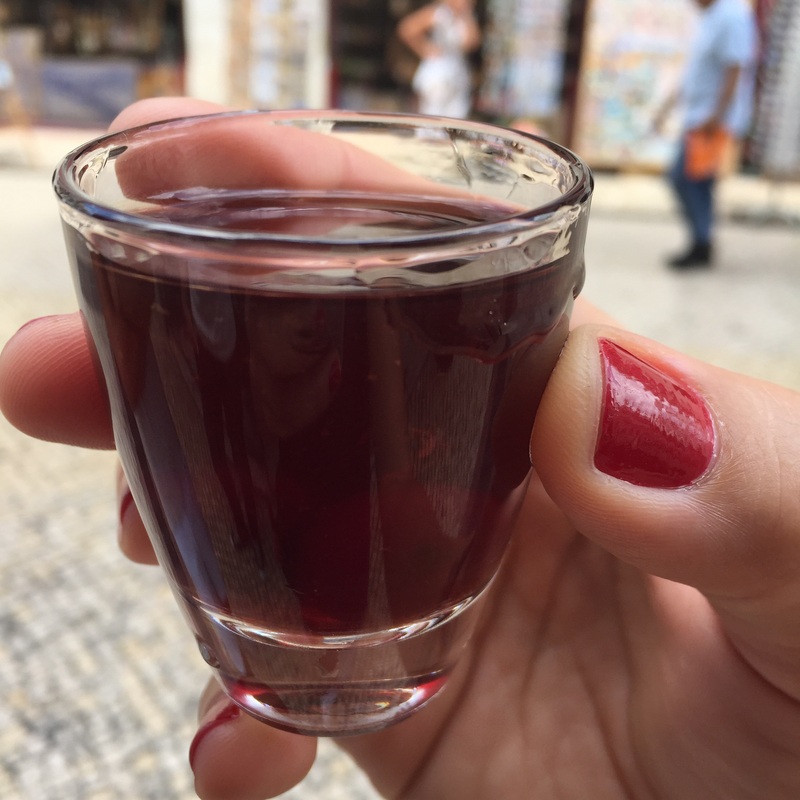 When I lived in Italy, for example, a sweet limoncello or a nice amaro (think Fernet-Branca or even Jager) followed any big meal, and I hadn’t realized how much I missed that until my recent trip to Portugal. 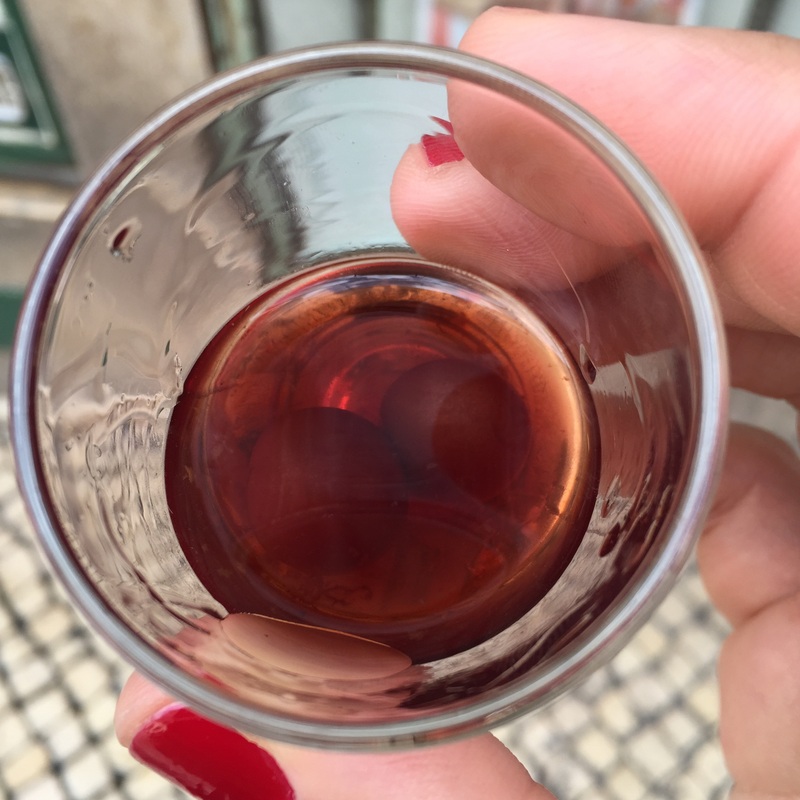 Not strictly an after dinner drink, Ginjinha (or also ginja) is the preferred sipping drink in Lisbon and other parts of Portugal, and is enjoyed really any time of day, after a meal or on its own. Made from sour cherries, sugar and alcohol, ginjinha has a strong but sweet, syrupy flavor. Most places, unless you request otherwise, will serve the shot of local liqueur with one of the boozy sour cherries plunked at the bottom, making for a potent and tasty finish to the brandy-like drink. During an afternoon food tour by a local foodie friend, we sipped ginjinhas outside a traditional meat and cheese shop, taking in the sunshine with our little Portuguese tradition. And while I could never duplicate Lisbon or the easy, breezy way of things there, I was sure to bring a bottle of ginjinha home with me. For now, I think I’ll start right there. This entry was posted in Uncategorized and tagged berry, cherry, Ginja, Ginjinha, Lisbon, Portugal, Portuguese liqueur. Bookmark the permalink. The don’t send any of that yummy stuff over here??? Drat! Great post about ginjinha, one of our favorite drinks. Obrigada! I need to open up the bottle I bought!